Our ’64 182 needed new belts. How we did it and how much it cost. This article is the first in a series about bringing a good used airplane up to more modern standards. 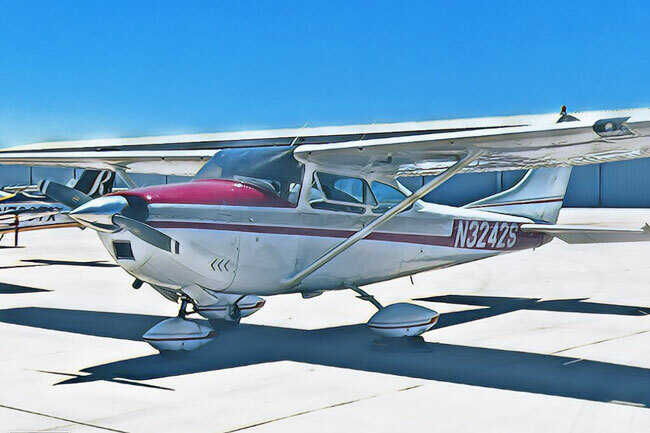 Our test subject is a 1964 Cessna 182G with a beautiful airframe, passable but old interior, avionics in dire need of updating and the original engine that has good compression and relatively low time since an overhaul 20 years ago. The prop looks like new, but is 12 years old. In this series, we’ll be examining not only the safety case for an upgrade, but the financial case for it as well. While few owners would choose to do all of the mods we’re doing with this lucky Skylane, each one of them makes sense as part of a larger if not so ambitious refurbishment project. Keep reading and see what N3242S looks and flies like when we get done with the process. My very first mod on the plane was a foregone conclusion: new belts. I had no idea where to start, but I knew the old ones needed replacement. 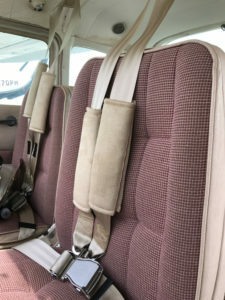 Try as I might, I’ve been unable to find out just when Cessna began putting shoulder harnesses into its airplanes, but I’m guessing that my 1964 Skylane might have been one of the first years for the option. The original belts were in surprisingly good condition, though their design was odd. The single shoulder harness ended in a loop through which you threaded the lap belt before buckling it. It felt for all the world that one wrong move could flip open the seatbelt fastener, but over the course of 20 hours of flying the bird with the old belts, that didn’t happen. That wasn’t all that was odd, though. The attachment to the roof structure was made with a single stainless-steel screw that looked none too beefy. After 53 years, how would it have held up in a crash? I shudder to imagine it. Maybe it would have slowed me down a little before I greeted the panel in the worst way possible, but I’m skeptical it would have done even that. The top two photos show the state of the factory-original belts, some of the first Cessna shoulder harnesses. They were a great idea, but with a single screw holding the anchor in place and a weird buckling system, we had little confidence in their ability to stave off disaster following a hard, off-airport landing. The new belts, an inertia reel harness system from B.A.S. improved on the old system in so many ways. I did some research and found that while there are other options, an inertia reel set of restraints from B.A.S. was getting a lot of love from folks in the vintage Cessna community. I punched in the address to the company’s website, navigated to the price list and took a look. Yow! A pair of four-point restraints in my plane’s color would go for just over $1,400. The installation would probably add another $400 to $500 to that, for a grand total of just under $2,000 installed. That’s a lot of dough for a $50,000 airplane, but I had a hard time imagining how I’d feel about not having spent the money if I ever found myself facing an impromptu off-airport landing. 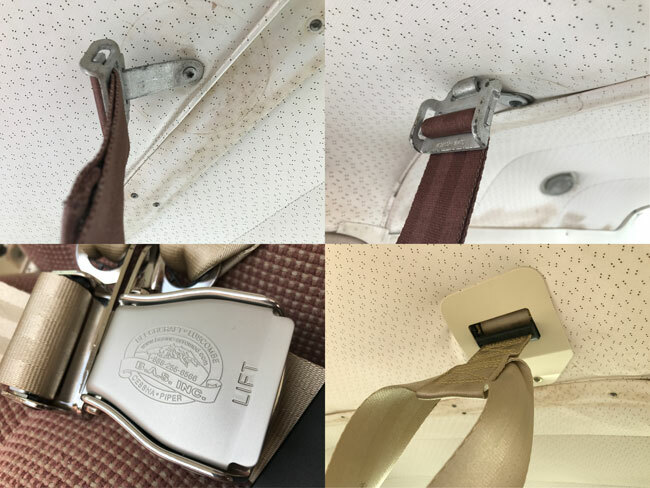 As luck would have it, Walter Lansing, the chief mechanic at my FBO (Redbird’s Skyport in San Marcos, Texas), was as experienced as anyone at putting these belts in, as he’d done more than a dozen installs in Redbird’s RedHawk 172 conversions. Walter took less than a day to get the job done and it came out beautifully, as you can see here. The belts are not only secured to modern standards, but they’re also incredibly comfortable. I opted for the “Utility”-style buckles, with the shoulder straps having slotted blades that slide through the tongue of the lap belt. When you’re not flying, they hang out of the way in back of the seat. I went for my first flight with them just the other day and they’re by far the most comfortable seat belts I’ve ever flown behind, silky to the touch, easy to use and comfortable. The inertia reels are silky smooth, but when given a good yank will stop you in your tracks. And, heaven forbid, should I ever need to depend on them, I’ve got a high degree of confidence that they will help keep my face as close as possible to its current configuration. $1400 are you kidding me! The ripping off of aircraft owners with ridiculous pricing like isn’t what keeps many from getting into the aircraft market. You said it yourself., $2000 for seat belts on a $50000 airplane. Something is way out of whack. They say, “Birds of the feather, flock together.” And business in aviation is good. Good for the buzzards, and the greedy bas*. * arrived about fifty years ago and keep adding to their numbers. A chicken lays an egg 200 years ago. Today that egg is still an egg, but the price of a dozen of them has soared. The chicken hasn’t improved his product in over 200 years yet we pay through the nose to enjoy his accomplishment. Who is the fool? The chicken, the egg or we who lose out due to some imaginary thing called inflation. When I started flying lessons were $12.00 an hour wet for a Cessna 150. All one’s logic can not excuse the rampant greed that produced the products we see today; nor can anyone excuse it. first of all, great idea for an article and the built in progression through the whole process. I, among other avid readers will sure enjoy your journey through the updates. Secondly, I would like to recommend that you include a comparison between the researched parts and prices and the final charge. For example, in the case for the seat belts, I would like to know if you really spent the initially thought out price of $500.00 or if it was a different amount. Largely due to an experienced mechanic doing the installation. And lastly, please give us a little bit more on the back story why you decided with C182 as opposed to a different model. Additionally, are you planning on updating a different aircraft after this one? Thank you so much, and keep up the great job, Robert. I sure enjoyed reading your first segment of the series. I’m considering the same upgrade on my 1973 Bonanza, also looking at Amsafe seatbelts with integrated airbags. Do you have any experience with those? What dose it cost to repair a battery box? I bet about 2 grand. Every one knows it is out of wack but how do you fix it? It is above my pay grade, but If every one who has a good solution got to together with the best interests of aviation it would be done. The place I rent went up on hourly rates because the plane was painted And got new carpet installed. I’ll be reading this series with baited breath. It is as if you were writing the series just for me. I purchased a 1977 C-182Q Skylane II last year. It is a low-time aircraft and in good condition, but the paint and interior are original and the panel is in need of an upgrade. The options for the panel are many and due to the avionics manufacturers coming out with great new products and STCs for existing non-TSO’d products all the time, the options are growing every month. I am planning to upgrade the panel next year and the interior and exterior in subsequent years. I very much look forward to reading about the upgrades you consider, the advantages and disadvantages of the various options, why you ultimately select the ones you select, and the cost of the upgrades (including installation) you select. Thanks for writing this series.